In Camera: Duo of Christoph Heemann and Timo van Luijk. In the mid 80’s Heemann formed HNAS, a radical German music collective with sense for experiment, collage, surreal humour and psychedelia. Heemanns more atmospheric solo work from the 90’s is mostly known for its introspective cinematic character and the subtle production work. He collaborated with many international artists like Jim O’ Rourke, Charlemagne Palestine, Andrew Chalk. In the early 90’s Timo van Luijk started the experimental music and multimedia collective Noise Maker’s Fifes. In his solo project – Af Ursin – he mainly works with acoustic instruments played and arranged in an intuitive way. With In Camera elements of the solo work of Heemann and van Luijk are combined resulting in narrative, reflective sound experience. 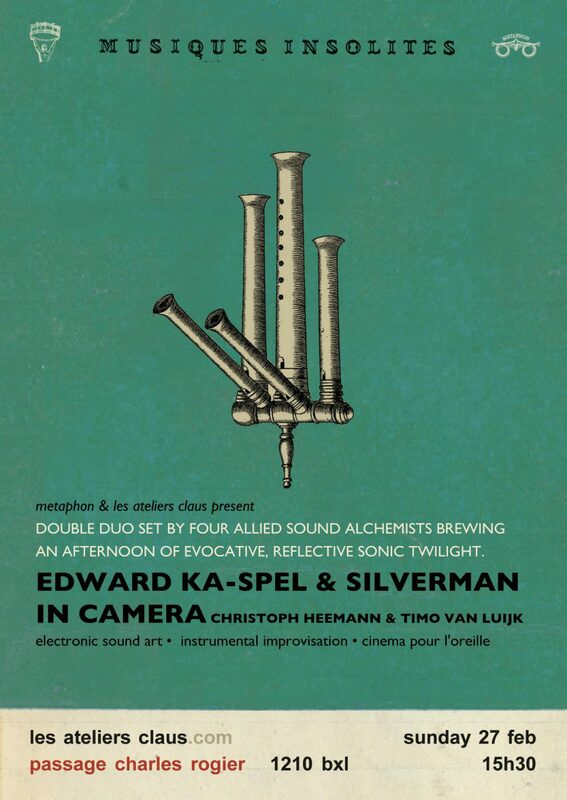 Edward Ka-Spel & Silverman: The core of the well known Legendary Pink Dots formed in England in the late 70’s. The group created its very own language crossing various genres (experimental, progressive, electronic, psychedelic, pop) fed by Silvermans distinct electronic rhythmic/melodic structures and the unique voice of Edward Ka-Spel omnipresent in all its lyrical dimensions. Throughout the years they produced dozens of albums and played about everywhere in Europe and the US. In both their solo work as in their duo project the repertoire rather consists of abstract electronic improvisations retaining the psychedelic character.